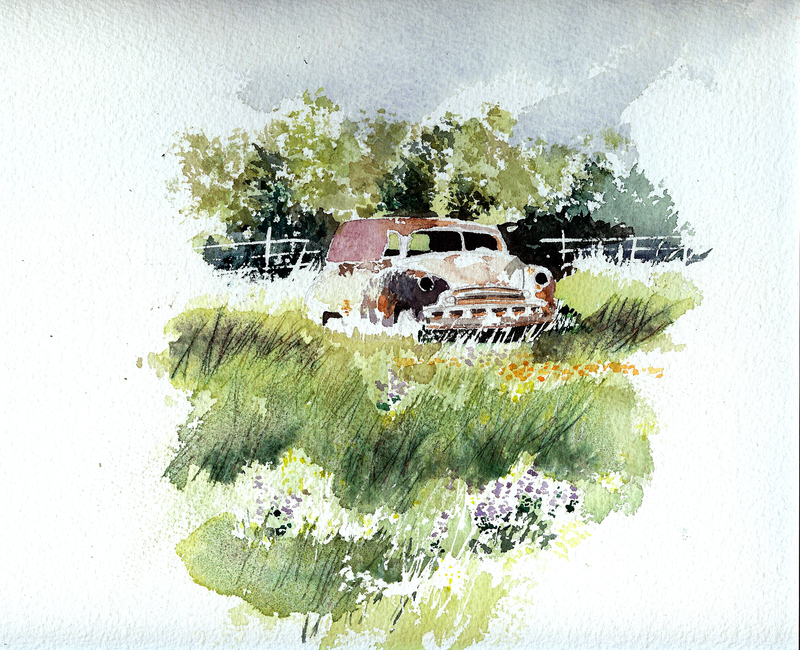 Here is the beginning of another plein air study I’ve been pursuing north of Hillsboro, Texas, along Highway 77. 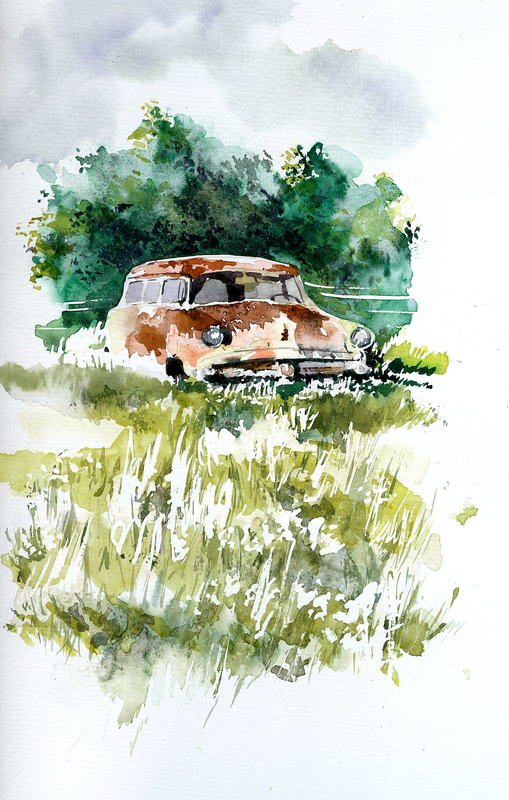 The owner of the farm has a field full of abandoned cars and trucks from the 1950’s. With my company called Recollections 54, I find this site to be a real gift for my watercolor compositions. 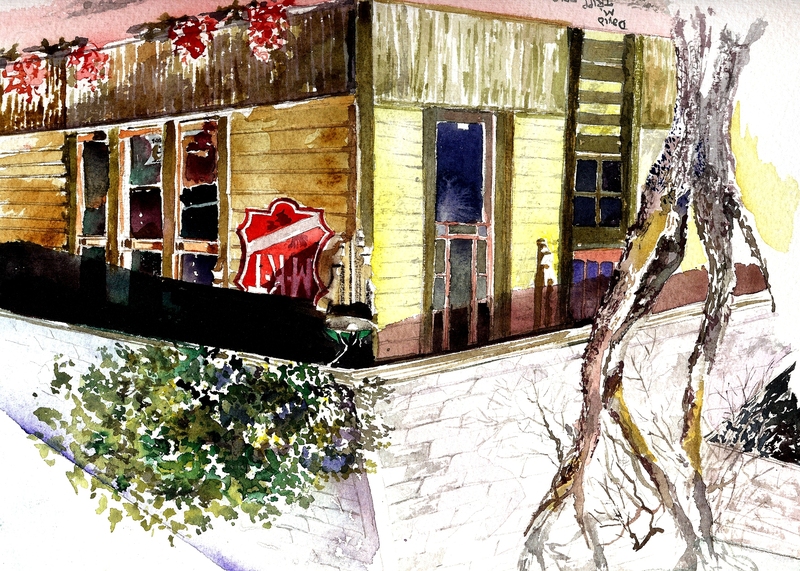 The evening was perfect for watercoloring outdoors. Temperatures at 6:00 were a little below 80 degrees, with a wonderful breeze stirring. I got lost in wonder as I sat in the shade of my Jeep and worked on this composition, listening to a car drive by every 5-10 minutes on the nearby highway. I was sorry that I couldn’t finish it as I lost the light less than two hours later. The time passed like it was 5 minutes, and I was really sorry I had to stop. Of course, tomorrow brings another school day. Perhaps I’ll get to return to this after school. It’s been getting harder to find time to paint as the school year draws to a close, and of course, the dreaded TAKS test is chewing up all our quality time this week. Later. Thanks for reading . . .
School has been keeping me buried in work, but I did manage to escape late Sunday afternoon, driving an hour south of where I live to capture this quick scene of a panel truck abandoned in a field of wildflowers. The sun, shadows, and temperature of the day was gorgeous beyond description, and I could have stayed for hours. But alas, there is still schoolwork to do and I’ll be up late again. This is the second watercolor I finished today while sitting in my art booth, avoiding the downpour that cursed us the entire day. Fortunately, the sales were still good, and ultimately, I got to “make hay while the sun didn’t shine.” Tomorrow is the final day of the festival, and I wish to God I could get through a day without rain. If not, I’ll just work on more watercolors, I suppose. Today was a rain-soaked Saturday at the Art in the Park in Kennedale, Texas. I spent the entire day inside my booth, avoiding the wet, and finishing up watercolors in progress. This is the M-K-T railroad depot in Hillsboro, Texas (I think it is being used for the Chamber of Commerce now). I began it 30 minutes before the sun set, and was fascinated with the glowing yellows and warm greens in that waning light. Finally, I got this one finished in time for the Art Festival that begins tomorrow. This painting marks one of my most sublime moments in plein air painting. 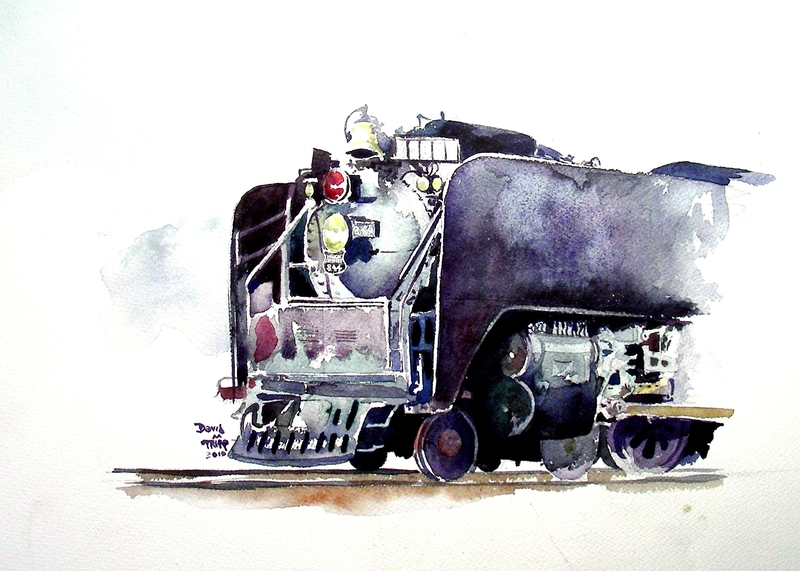 I traveled to Fort Worth on a Friday afternoon to paint this train that was arriving that day. On the following morning, rising at 6:00, I returned to the location and did this painting (started it, anyway). 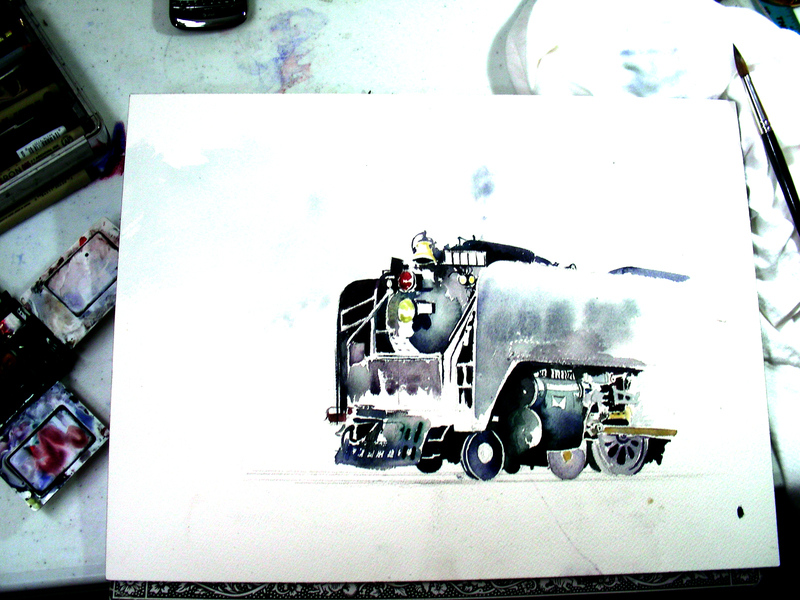 The wheels and detailing I completed in my studio this evening, using photos I had taken of the locomotive. I am now making 5 x 7″ greeting cards of it with an explanatory text on the back. I just wanted to post this one quickly for the blog. I need to get back to work on the festival “stuff.” It’s 9:12 p.m. and I have much to do still. Hope you enjoy this GATX freight that I painted at the same location in Burleson (but I stayed a safe distance from the tracks this time!). I have a three-day art festival beginning tomorrow (Friday) at Art in the Park Festival in Kennedale, Texas. This afternoon, I have been a juggler with too many balls in the air. 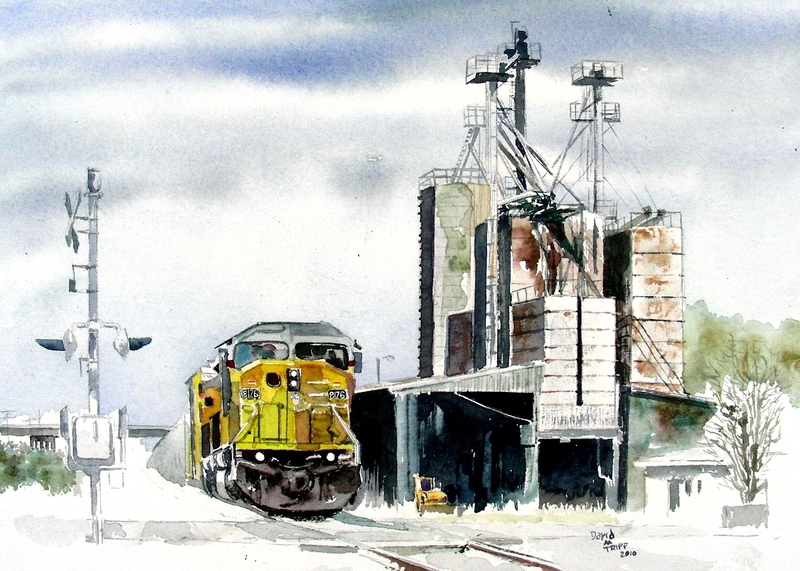 Sixty-four postcards were mailed, and email strand was sent, and announcement was made to stuff over two hundred teacher mailboxes in the morning, I finished this small composition and a companion piece involving a GATX freight train in the same location. I’m nearly finished with the Union Pacific #844 that I began a week ago. I have printed several dozen 5 x 7″ greeting cards with my watercolors on the cover, Oh yes, and I taught three different subjects today at school. Hopefully tomorrow will be calmer after the festival gets underway (but first I have to teach three more classes, then dash to the park and set up my 10 x 10′ booth. My wonderful wife will assist me in that, as she has also in a myriad of other details related to this festival. How fortunate to have someone that committed to this enterprise. Here is a southbound Union Pacific freight in Burleson, Texas that I began last month. I recall, with amusement, that I had set up alongside a dual set of tracks, working on the structure in the distance, when I heard the whistle of the distant freight and scurried to get out my digital camera. Thinking the train was on the far set of tracks, I stepped close to the tracks nearest me, and zoomed in on this freight and took the picture, so I could paint it in my studio later. When I lowered the camera, I realized that the train was on the tracks right in front of me, and was highballing in my direction, closing the distance fast! Stupid! It’s hard to concentrate on school work daily when I have this image burned into my retina from last Friday and Saturday of the Union Pacific #844 that visited Fort Worth. I had a full slate of high school classes today, and a college class tonight, but managed to steal about 90 minutes at my drafting table this evening and resume work on this composition. All I’ve managed to do this evening is work on the wheels, track and cowcatcher. At least it’s starting to look more like a steam locomotive now. I think it will really begin to “pop” once I add the numbers and lettering to the signboards on front. The bell could use a little more burnishing as well. 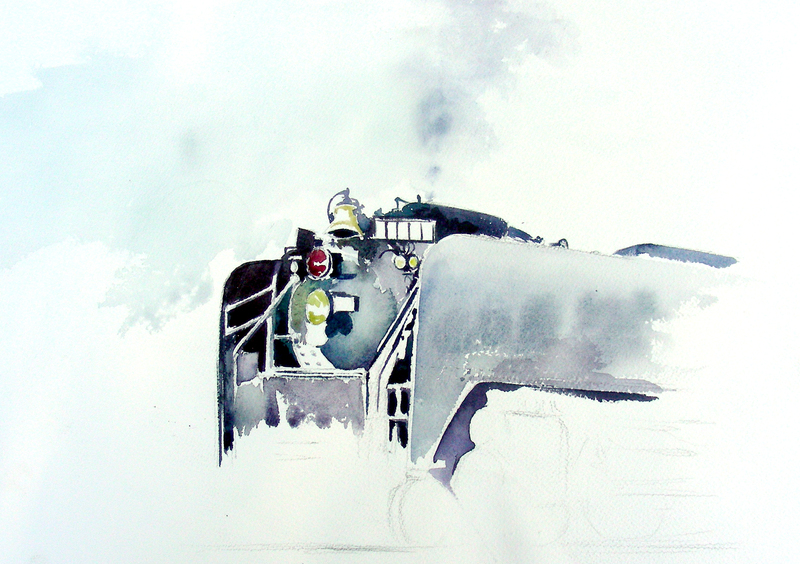 My major challenge with this watercolor is rendering the “blackness” of the locomotive. I threw away my black pigments in June of last year, and have really enjoyed the challenges of mixing my own cool and warm blacks. Of course with this image, it’s been a challenge, because I have to keep finding ways to separate the cool and warm dynamics of the overall black color of this locomotive. This is turning out to be great fun, and I’m delighted that I have two of these in progress (the first one I haven’t touched since Friday night, but I will). I plan to do a third, because I was smitten when the morning sun came out strong, and lit up the front of this train with bright gold colors. I had already committed to the muted, overcast lighting, and had the basic washes already laid in. Fortunately, my camera was with me, and I captured some nice photographs of the sunlit locomotive, before the sun hid itself for good. So, I plan to do a sun-washed gold-highlighted rendering of this loco as well. I’m just sorry that I have to put in the lion’s share of my daily hours tending to school details. Tomorrow I’ll face three different preps with three different classes. And, of course, I have a 3-day art festival coming up this weekend. There is still plenty of matting, shrinkwrapping, labeling, and inventory checking to do before the big weekend arrives. And . 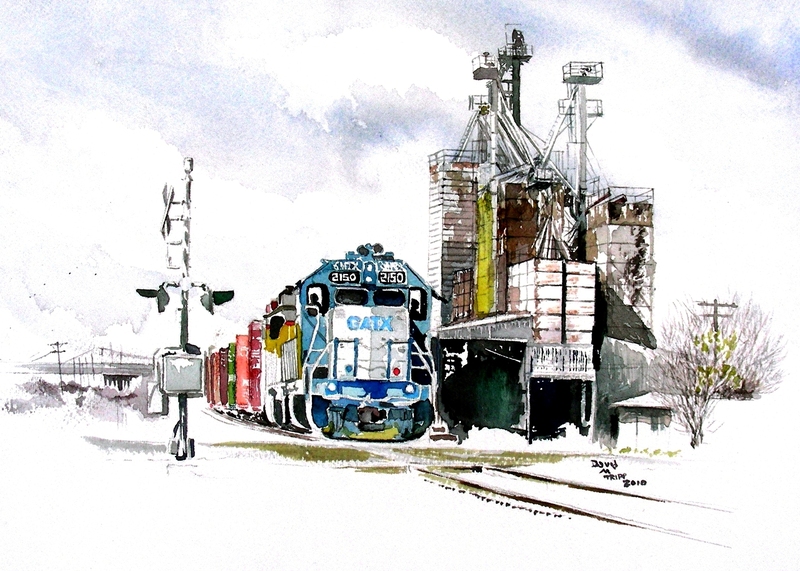 . . I’m hoping to finish this along with the other two freight train paintings posted previously (a UP and a GATX freight). So little time . . . When the alarm went off at 6:00 a.m. and it was still dark, I thought I had made a mistake. When I dressed and stepped outside later, without showering, breakfasting, and found it to be chilly in the pre-dawn air, I thought I had made a mistake. When I found the ramp to US 287 closed, I thought I had made a mistake. When I missed the I-30 exit ramp off I-35W I thought I had made a mistake. It seemed the morning would not go as planned. Upon my arrival, it was still murky outside, but I took up my position on the north side of the parked UP 844, and as I drew out my supplies from the backpack, I realized I had not packed bottled water. I knew I had made a mistake. Oh well. Sharpening a pencil, I decided to draw slowly, deliberately, carefully. After I had done nearly all I could, and wished I had water so I could flood color on the page, Mr. Belnap of Union Pacific (who had introduced himself the evening before) came by. When I asked if there was bottled water available anywhere, he directed me to a cooler set out for the employees, filled with bottled water! He said “Help yourself.” The morning was saved after all. I enjoyed the overcast light on this magnificent locomotive, and once I had blocked in all the tones, the sun then popped out, showing a brilliant yellow light on the front. I couldn’t change the watercolor, so I quickly took several photographs, and then the sun went away for good. So . . . I have the best of both worlds. Hopefully soon I can begin another study of this locomotive under the bright morning sunlight conditions. The train pulled away at 8:30, and the moment was over, but not the memory. 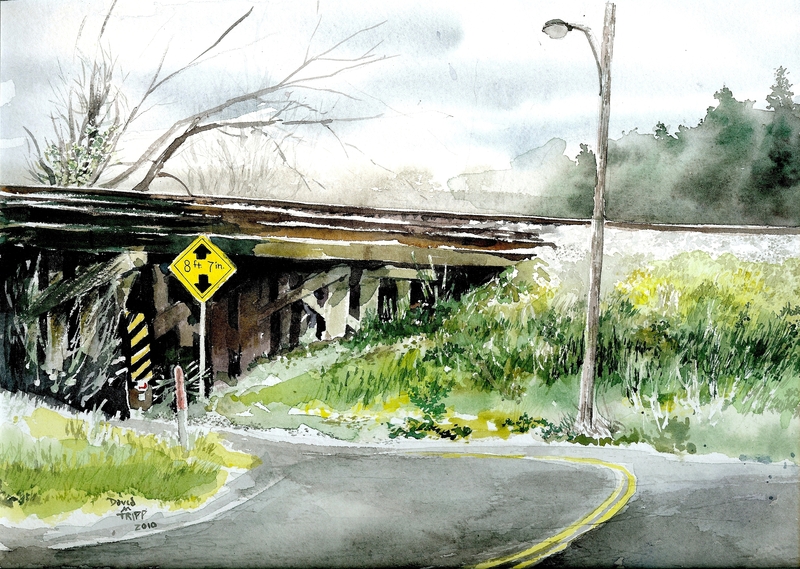 It was a great morning to be out sketching. The Union Pacific #844 (last steam locomotive to be manufactured by Union Pacific) has traveled from Wyoming all the way to Fort Worth, where it arrived around 5:00 this evening. I was on location to paint it directly (as posted) and have taken many, many photographs of it for studio work in the future. 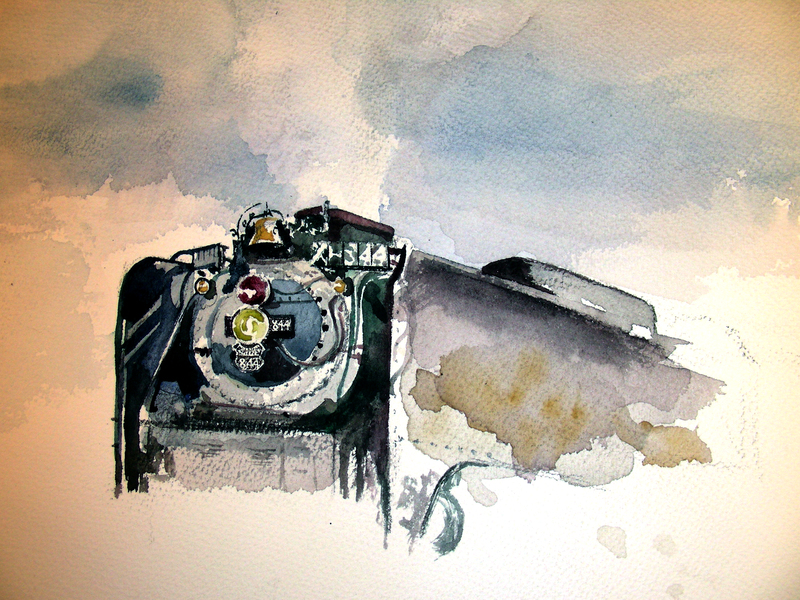 I met hordes of fascinating people this evening while painting–friendly railroad enthusiasts. I even got to meet some Union Pacific employees, including the Director of Operations Support Transportation. Everyone was in a festive mood and the train had a store selling memorabilia from one of the passenger cars. The train departs tomorrow morning at 8:00, heading south to Houston. I have a notion to set an alarm rise early, and see if I can capture some good compositions in the morning light. Thanks for reading. This evening was very refreshing!